Medieval Lord Dagger for sale measures 18 ½ inches in all. These popular medieval daggers feature an intricately designed cast metal guard, pommel and handle. The circular pommel is engraved with the words Earl of Huntington. The pommel contains a simulated red ruby. These medieval daggers have a 10 3/4 inch stainless steel blade with a blood groove. A decorative black, gold and red colored chain is attached to the black wooden scabbard. 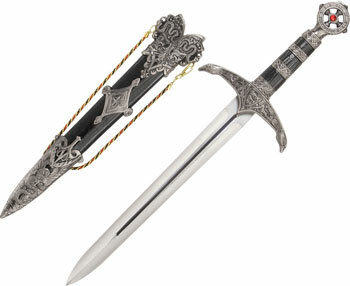 Buy the Medieval Lord Dagger for $19.99.